Participants were asked to name companies they consider sustainability leaders, why they think a firm is a leader in sustainable development and what types of leaders have done the most to advance sustainability in the past year. In addition to Unilever, the experts named General Electric, Interface, Wal-Mart and Marks & Spencer as the top five firms (in descending order) when it comes to sustainability leadership. 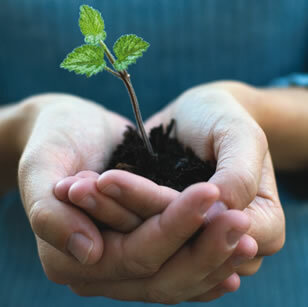 Last year, just 5 percent of the respondents named Unilever a top sustainability leader; this year, 15 percent did so. By comparison, GE and Interface each were recognized as leading firms by 12 percent of respondents this year; Walmart, by 11 percent; and Marks & Spencer, by 8 percent. Click on image to view full-size version. While Unilever, like others in the upper tiers of the list, had made the roster before, it appears that the firm's striking ascent to the No. 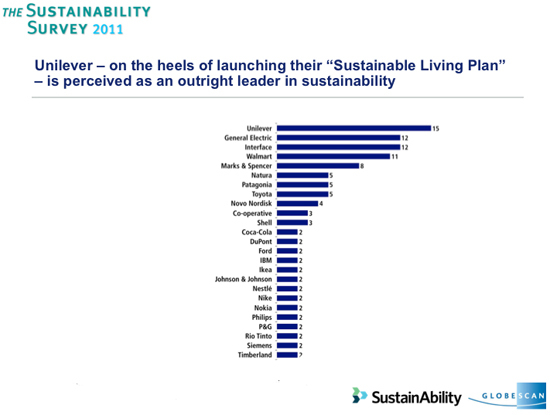 1 spot is largely due to the company's Sustainability Living Plan -- unveiled just four months before the survey. Under its ambitious 2020 sustainability plan, Unilever intends to improve the health of 1 billion people, buy 100 percent of its agricultural materials from sustainable sources and slash the environmental impact of its products by half -- all while doubling its revenues. The strong alignment and deep integration of sustainability values into company operations, the articulation of those values and the synthesis of all sustainability efforts in a clear and cohesive framework resonated with the experts, according to GlobeScan Senior Vice President Chris Coulter. "The stakes for sustainability leadership have been raised to a new level -- these are the new table stakes," said Coulter. The issue of leadership among a field of corporate leaders has long been a "tightly contested question," he added. 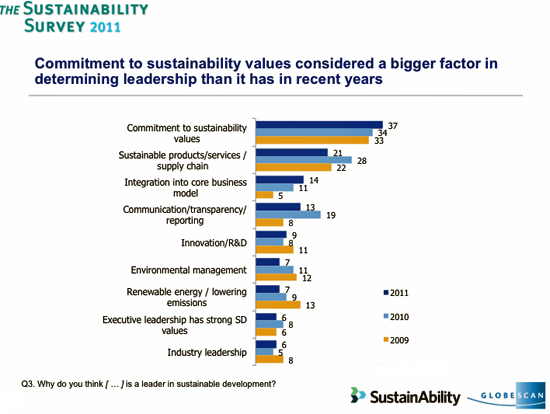 Commitment to sustainability values has become an increasingly important differentiator, according to results of the past three surveys. The chart below shows the steady growth of the importance of that quality, compared to the fluctuation of sustainable products, services and supply chain as a factor. In light of those responses, it's interesting to see how consumer products behemoth Procter & Gamble fared with the sustainability experts. P&G released its sustainability vision last September and declared that it plans to power its plants with 100 percent renewable energy, use 100 percent renewable or recycled materials for all products and packaging, have zero consumer and manufacturing waste go to landfills, and design products "that delight consumers while maximizing the conservation of resources." 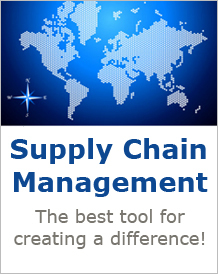 The company held 22nd place in the survey's list of leading companies. Despite their strong regard for specific companies, the survey respondents didn't rate business chiefs highly when it came to recognizing the types of leaders who have done the most to advance sustainability. Social entrepreneurs topped the list with 57 percent of respondents saying leaders in that group did an excellent job of advancing the sustainability agenda in the past year. Just 24 percent of the experts said corporate leaders did an excellent job, but that still puts business leaders well ahead of nationally elected government leaders. Only 6 percent of the respondents considered that the elected officials did an excellent job.